Q:The water running with bubble,it doesn't improve after installation,smells very tasty. Please release first water for 5-10 minutes. A:It depends on which part,if it is the interface leakage,please check whether there is a water gasket. The water leakage problems please send us with a picture,we cann't judge without pictures. Q:No water pressure,the filter water is very slow. it is recommended to do ceramic filter. The faucet can not be connected with the water filter well，and the water filter will be washed away after opening the faucet. In this condition,customers need to unscrew the bubbler firstly and then use a 22/24 tooth installation. Widely use,and can be install by different kinds of faucet. Strong filter function,different water can choose different filter. 1.Please don't use it when water temperature is over 45℃. 2.The product is just for the municipal tap water. The accuracy of filtration is up to 0.1um so that it can filtrate impurities,sediment,harmful materials, chlorine,rust,heavy metals,algae,colloid,bleaching powder,red worm,impurity and so on,the water tastes pure and natural. 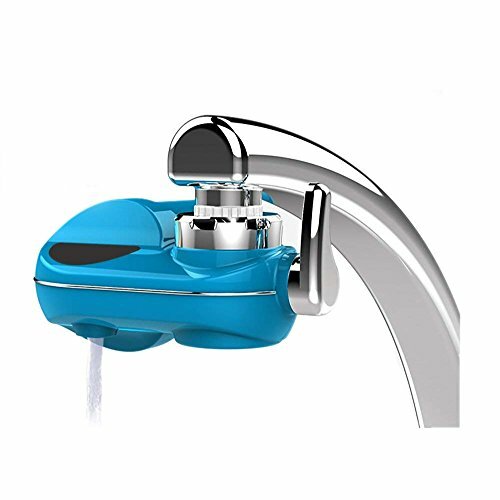 There are three kinds of water filtration faucet mount with great power,you can use different filter depending on the water quality. and it is easy to replace the filter.Convenient and providing a comfortable cooking environment for your mom. The Powpro faucet water filter has double outlet,purified water and tap water outlet,so the water is clean and it is safty for the healthy of your family members. The filter is equiped with the multi-use interface,simple and quick installation.Water purification flow is 2L/MIN,large capacity for your daily uses. The shell of the Powpro faucet water filter is made of high-quality non-toxic plastic,safty and suitable to protect your health, especially for your mom and a baby.For their healthy,a filter is your best choice. If you have any questions about this product by Powpro, contact us by completing and submitting the form below. If you are looking for a specif part number, please include it with your message.